The American robin's habitat woodland, open farmland and urban areas. Its food is a mixture consisting largely of insects and earthworms. 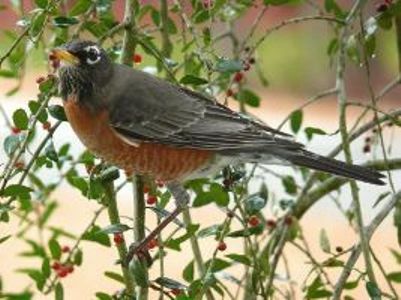 Robins also like berries, including black cherry tree. They will fly in especially to feed on them during the period when they ripen. Robins can be seen running across lawns, picking up earthworms. The running and stopping behavior is a distinguishing characteristic. When stopping, they are believed to be listening for the movement of prey. 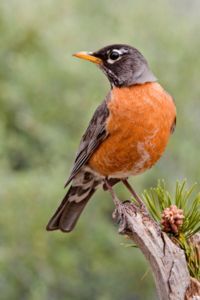 The American robin is 10–11 inches long, weighs about 2.7 oz., and has gray upperparts and head, and orange under parts, usually brighter in the male. During the breeding season adult males grow distinctive black feathers on their heads. After the breeding season they lose the bright plumage. This bird breeds throughout Canada and the United States, and most winter in the southern parts of the U.S.A. to Guatemala. Most go south by the end of August and begin to return north in February and March. Males return to the summer breeding grounds before the females and compete with each other for nesting sites. Females then select mates based on the males' songs, plumage and territory quality. 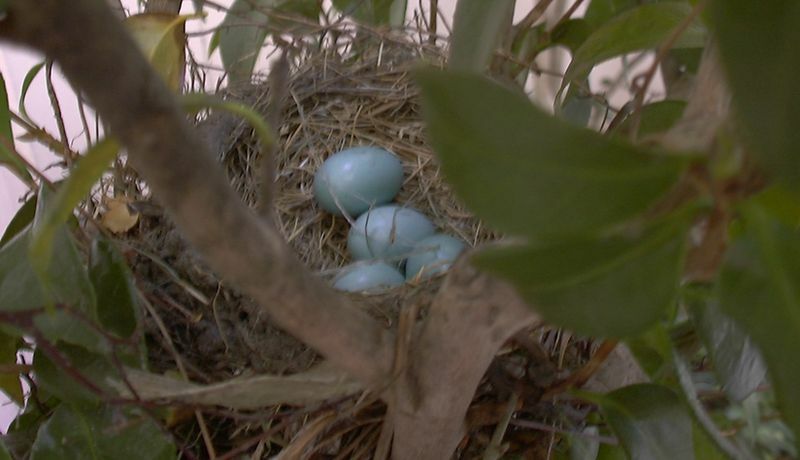 Females build nests and lay three or four blue eggs. Incubation is almost entirely by the female 11-14 days to hatching, with another 15–16 days to fledging. Two broods per season is common. The adult male looks after the fledged chicks while female incubates her second clutch.